Pakistani media is widely criticized by masses for its unprofessional and unauthentic reporting. Since social media has become a popular source to reach audience, almost all Pakistani media houses have turned to social media to reach audience and spread their message. However, most of these news and media brands are using inappropriate ways known as 'click bait' to get the attention of users and land them to their website pages where they make money from ads. There are several such pages on Facebook that are mainly depending on click bait titles of their news updates. They would post more than 50 posts with their website links daily. People click on those links thinking it a major news as written in titles however the landing pages display almost completely different news than the post uploaded on Facebook. These pages are generally not good for mental health as well as against journalism ethics. The best way to not to feed your minds with such stupid news is unlike those pages. Most of these pages have millions of likes as they heavily advertise their pages to buy likes and boost their posts to get maximum attention of Pakistani audience. If you want to give your mind a favor, it is wise to unlike these pages and depend on other sources for latest news updates until they start following journalism ethics. They have more than 2.5million page likes and all they are doing is promotion of their links with silly titles. With nearly 3 million likes on page, Daily Qudrat is another media franchise that is running on the pillars of subtle news titles. UrduPoint is one of the popular Urdu website and they too are promoting curiosity through their silly titles. With more than 7 million fans, they are another media outlet posting sensational news when in reality their contents are different then what they say in their titles. He has hired team of 15 people who work day and night to post nonsense. Apart from clickbait titles, most of their updates have been found fake. Dunya News' official page for their comedy program Hasb-e-Haal is yet another such page that spreads subtle vibes. They put a play icon on their link thumbnails and trick users to land them on their own page. 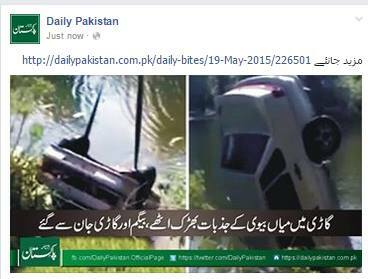 Same is the case with their main official page DunyaTV. There are hundreds of Facebook pages that are run by the names of Pakistani celebrities when all they do is promotion of inappropriate contents including clickbait. If you find nonsense article links on celebrity pages, chances are they are fake pages and have nothing directly to do with that particular celebrity.